Today’s recipe brought to you by my Mexican-food-loving boyfriend, Ian, who has gotten me addicted to it as well (probably a good thing, since we are in Texas and all). He’s the stud you’ll see assembling things in the pics below. These are simple and delicious. And I call them Mmmchiladas instead of plain enchiladas because they are that yummy. Just a warning, declaring it to be Mmmchilada night may inspire silly dancing and co-opting of show tunes with lyrics replaced by Mmmchiladas and talk of beef and cheese. Or at least that’s been my experience. Ahem. Enjoy! Note: This recipe is for very basic (and very cheesy!) beef enchiladas. Feel free to add in things like olives, jalapenos, etc. if you wish. After cooking, you can also top with guacamole, sour cream, etc. Nothing beats a flexible yummy recipe! Brown the beef in a medium skillet with the green onions. Drain and set aside. Heat the vegetable oil in a small skillet. Once hot, briefly cook each tortilla in the oil to soften it up (about 30 seconds each). Flip halfway through so you get both sides. Place on a paper-towel covered plate to cool until they can be handled by hand. Pour one of the cans of enchilada sauce into the bottom of the glass baking dish. Take a tortilla, wipe along bottom of dish to coat each side in sauce, then fill with beef and cheese, and roll up. Repeat for each tortilla until dish is full. 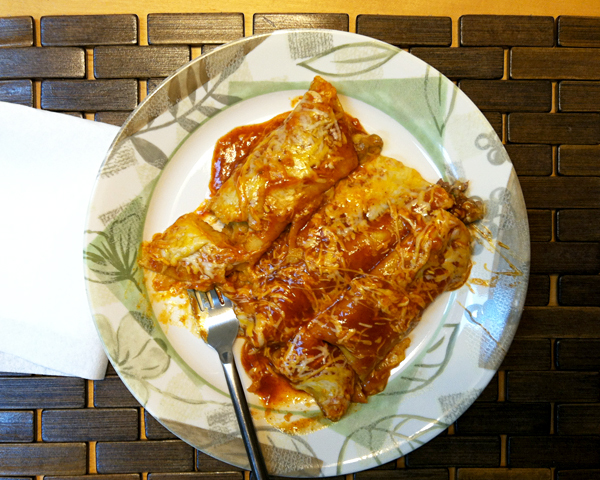 Note: our 9″ x 13″ dish holds 16 rolled enchiladas and one open-face corner one (see pictures). We like them super cheesy, so we generally use up one bag of cheese on the fillings, and the rest is for on top. Feel free to adjust to your own cheesy preferences though! Use the other can of sauce to cover the enchiladas evenly, and then use the other bag of cheese to cover that. It should be a dish full of cheesy saucy goodness at this point. Put in the oven and bake for 15-20 minutes, or until cheese on top is melted and insides are warm. Garnish as you desire, then serve and enjoy! All cheesed up before the oven. I wasn't kidding when I said we like 'em cheesy. Fresh out of the oven and ready for being nommed. Oh my GOODNESS, these look amazing. I think I just figured out what I’m making for dinner tomorrow. I love enchiladas! I’d have to make them veggie but it’s all in the sauce. Hehe. Let me know how the veggie ones turn out!